If you have a Harry Potter fan in the house, then you’re probably familiar with the books and movies. 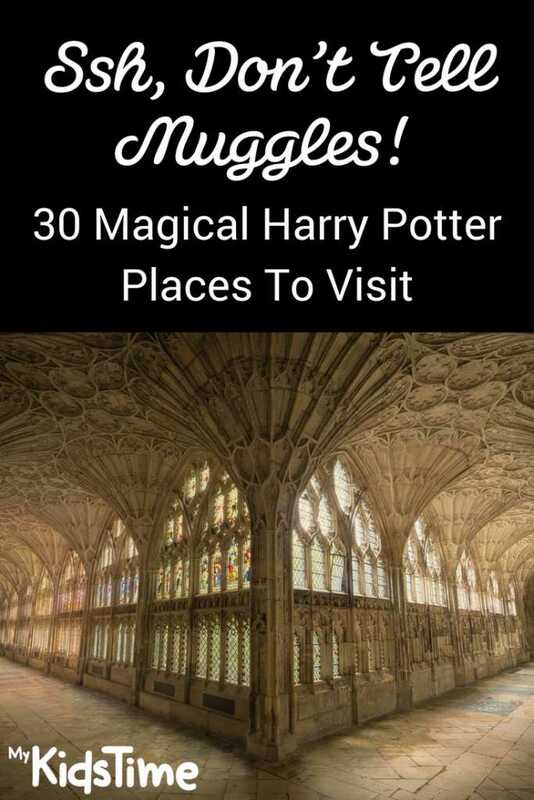 Most of us Muggles know there’s a Wizarding World of Harry Potter but did you know there are lots of other magical Harry Potter places to visit? These 30 places are guaranteed to thrill your Harry Potter aficionados! 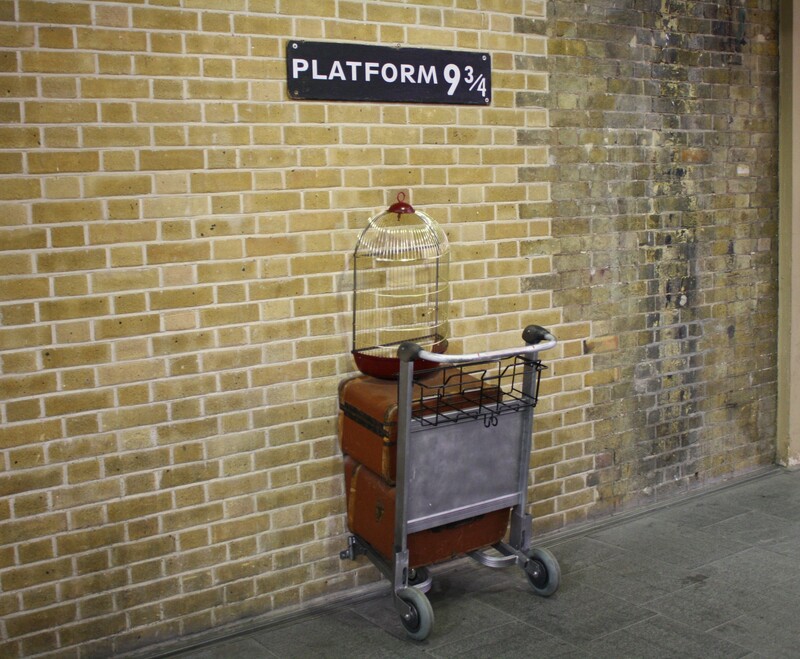 Probably the most famous Harry Potter place to visit is Platform 9¾ at King’s Cross Station, London. As any Harry Potter reader knows, the pupils of Hogwarts leave from here and have to go between Platforms 9 and 10 to find their magical train to head to school each term. At the real King’s Cross Station, you’ll find the sign for Platform 9¾ on the wall on the station’s concourse (and the Harry Potter gift shop nearby of course!). Enjoy the luggage trolley embedded in the wall, and make sure to take a pic of you starting your magical school journey. Next door to King’s Cross is St. Pancras Station, a truly incredible, neo-gothic building. It has been described as one of the most elegant stations in the world. 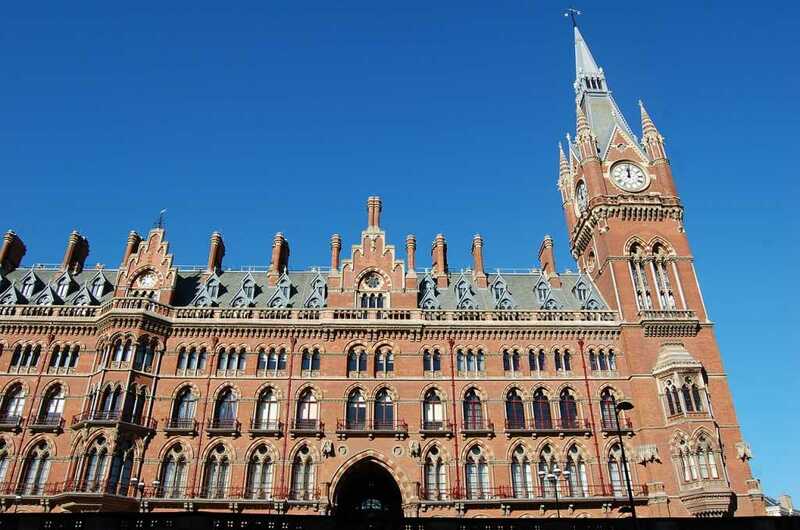 While the school pupils in Harry Potter boarded Hogwarts Express at King’s Cross, the exterior of St. Pancras will be familiar for scenes such as when the Weasley’s magical Ford Anglia takes off in Harry Potter and the Chamber of Secrets. 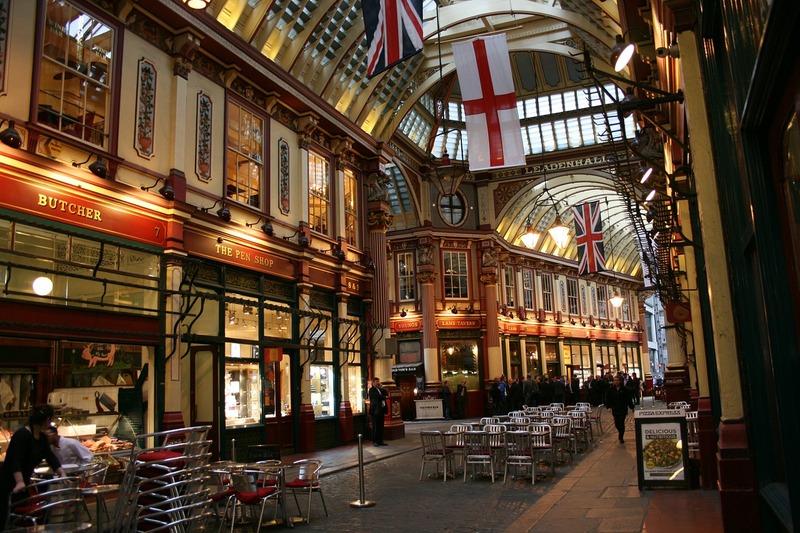 Leadenhall Market in London are where the exterior shots for The Leaky Cauldron were filmed. The Market actually dates back to the 14th century, situated in what was the centre of Roman London. Originally a market selling meat, poultry and game, it managed to survive the Great Fire of London. 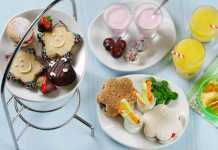 Nowadays you’ll find nice restaurants, cafes, bars and retailers. Part of Harry Potter and the Philosopher’s Stone (the first film in the blockbuster series) was filmed in Leadenhall in 2000/2001. The market was used to represent the area of London leading to the popular wizarding pub The Leaky Cauldron and magical shopping street ‘Diagon Alley’. The famous snake scene from Harry Potter and the Philosopher’s Stone, where we first find out that Harry can speak Parseltongue, was filmed in the Reptile House at London Zoo. In the scene, a burmese python speaks to Harry Potter (played by Daniel Radcliffe) for the first time. In real life, the enclosure that was filmed is actually home to the Zoo’s black mamba! 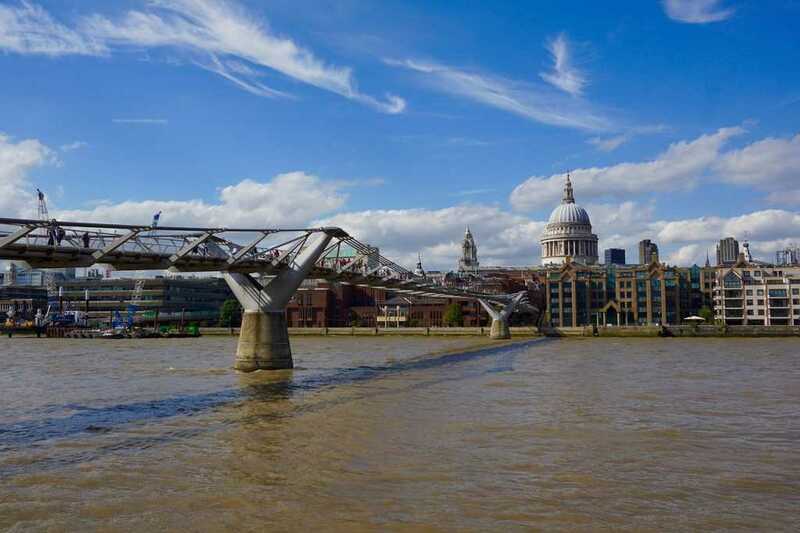 In the dramatic opening scenes of Harry Potter and the Half-Blood Prince, the Millennium Bridge collapsed into the River Thames destroyed by Fenrir Greyback and a small group of Death Eaters. In real life, the Bridge of course is still there, it’s a pedestrian suspension bridge that crosses the River Thames, linking Bankside with the City of London. and of course purchase yourself a wand! There are also seasonal exhibitions so check what’s on before you go. Travel tip: from central London take a train to Watford Junction then there’s a shuttle bus. 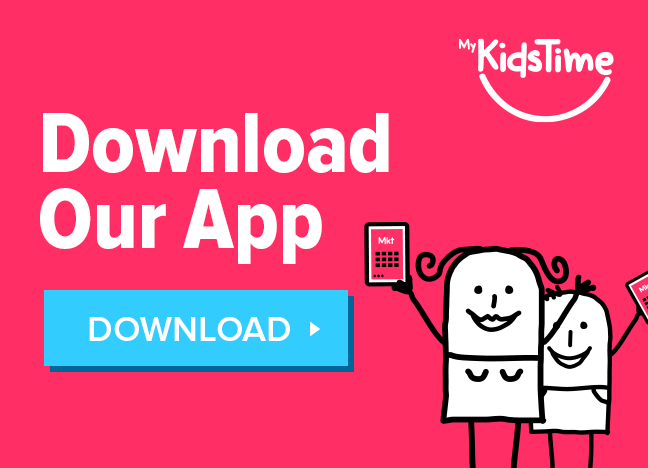 If coming by car, there’s free parking for ticket-holders so book in advance. 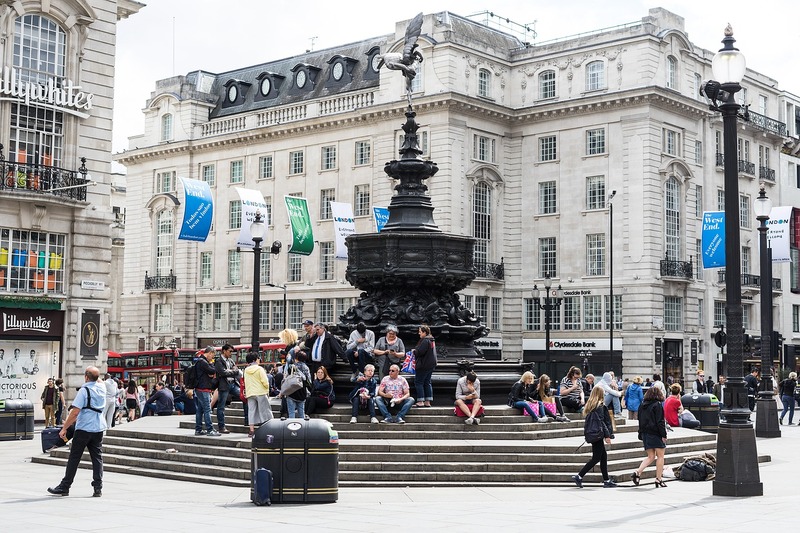 Piccadilly Circus in London features in the film Harry Potter and the Deathly Hallows – Part 1 when Harry, Ron, and Hermione run from Ron’s older brother Bill and Fleur’s wedding when they learned Death Eaters are after them. 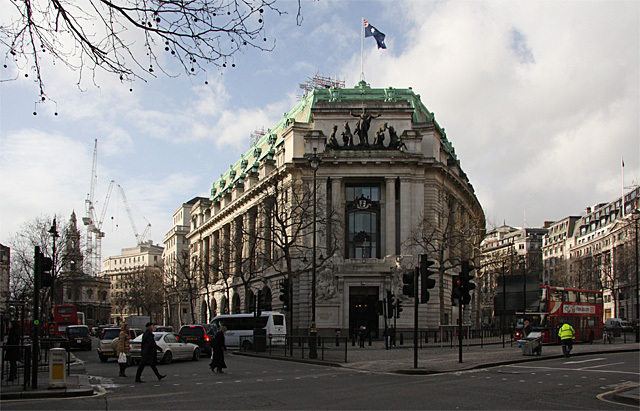 Australia House in London was where scenes for Gringotts Wizarding Bank (the only known bank of the wizarding world) in Harry Potter and the Philosopher’s Stone were filmed. It’s not open to the public unless you are there as an Australian citizen on official business, as it is the home of the Australian High Commission on the Strand, but you can walk around and view the exterior of the building. 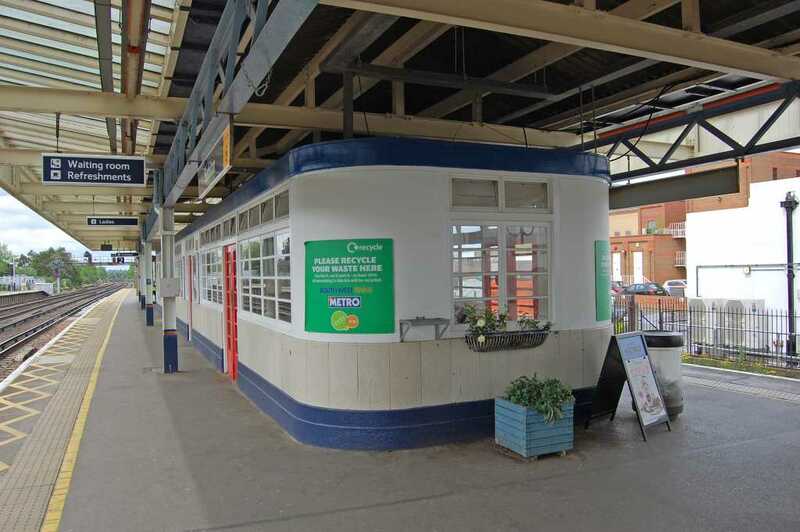 In Harry Potter and the Half-Blood Prince, Harry reads about the attack on the Millennium Bridge in a little cafe inside a train station, filmed at Surbiton Railway Station in the suburbs of southwest London. Later Dumbledore picks Harry up at the Station. 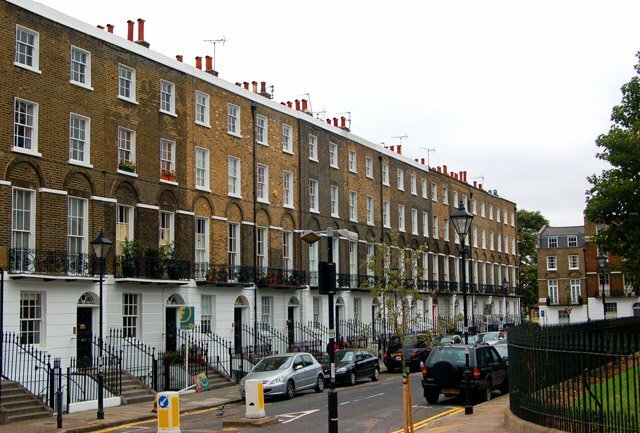 In the movie Harry Potter and the Order of the Phoenix, the row houses on Claremont Square in Islington were used as the exterior of Grimmauld Place, Sirius Black’s ancestral home and the headquarters of the Order of the Phoenix. 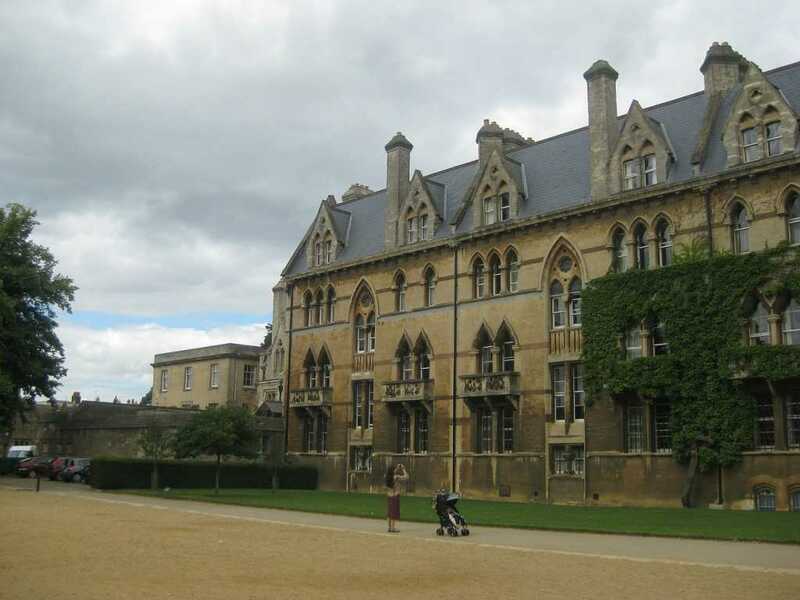 Outside London, you’ll find some of these fun Harry Potter places in England to visit. Alnwick Castle in Northumberland was featured in Philosopher’s Stone, where Harry had his first flying lesson and showed his promise as a Seeker. You’ll recognise The Outer Bailey, where Harry and his fellow students learned to fly broomsticks with Madam Hooch. The courtyards and baileys of Alnwick Castle were used to film Hogwarts students and staff going about their daily activities. ​The Lion Arch was a way in and out of Hogwarts, heading towards Hagrid’s cabin and the Forbidden Forest. 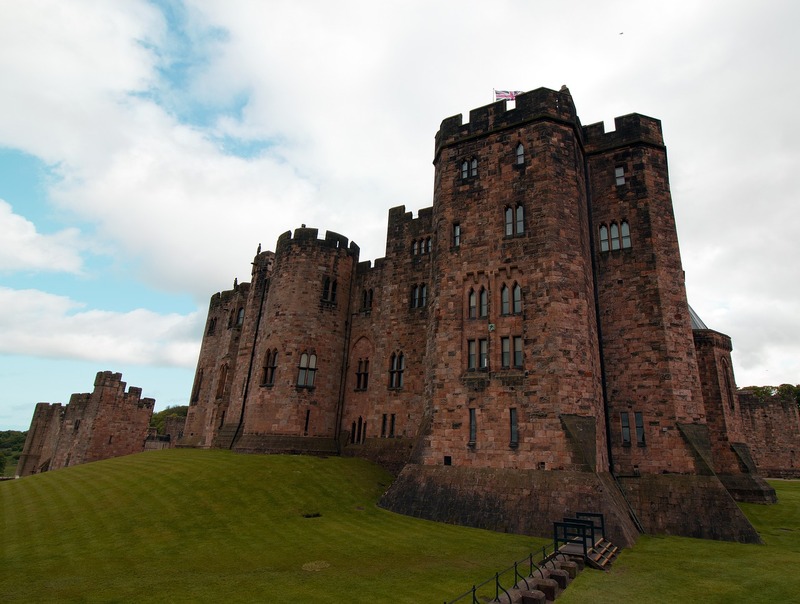 It’s a fun castle to visit and they have lots of child friendly events and workshops including Broomstick Training and the Battleaxe to Broomstick Tour, a tour of the Castle’s grounds with a costumed guide, including stories of Harry Hotspur and behind-the-scenes anecdotes from the Harry Potter films. 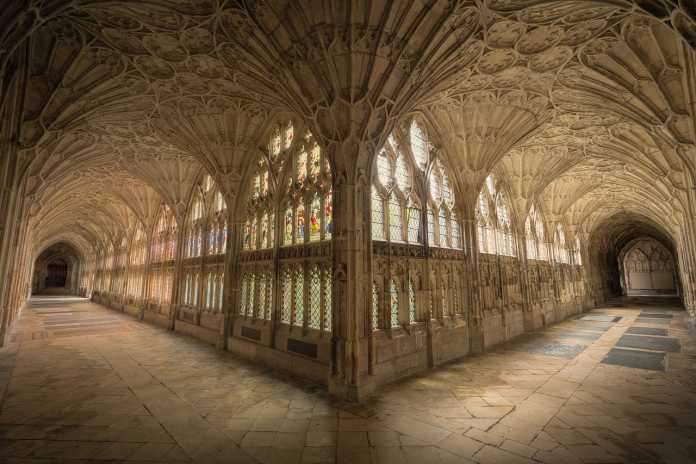 Gloucester Cathedral in Gloucester has been used for many Hogwarts interior scenes for the Harry Potter films. For example, in Harry Potter and the Philosopher’s Stone, the cloisters double up as a corridor in Gryffindor, where Moaning Myrtle flooded the toilets and where the haunting words, “The chamber of secrets has been opened” appeared. 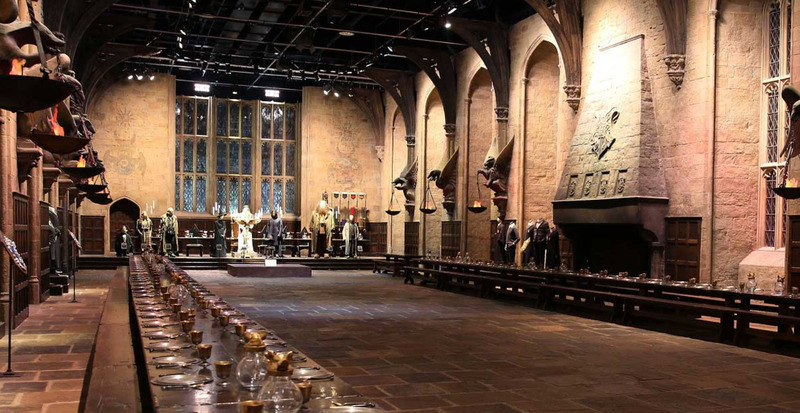 Christ Church’s Great Hall was the inspiration for the impressive Hogwarts Dining Hall, recreated by the movie makers at the London studios. When you visit Christ Church, you may recognise the Hall Staircase where Professor McGonagall first met Harry, Hermione, and Ron. The Hogwarts Express stop at Hogsmeade in the Harry Potter films is actually Goathland Railway Station, in Yorkshire. 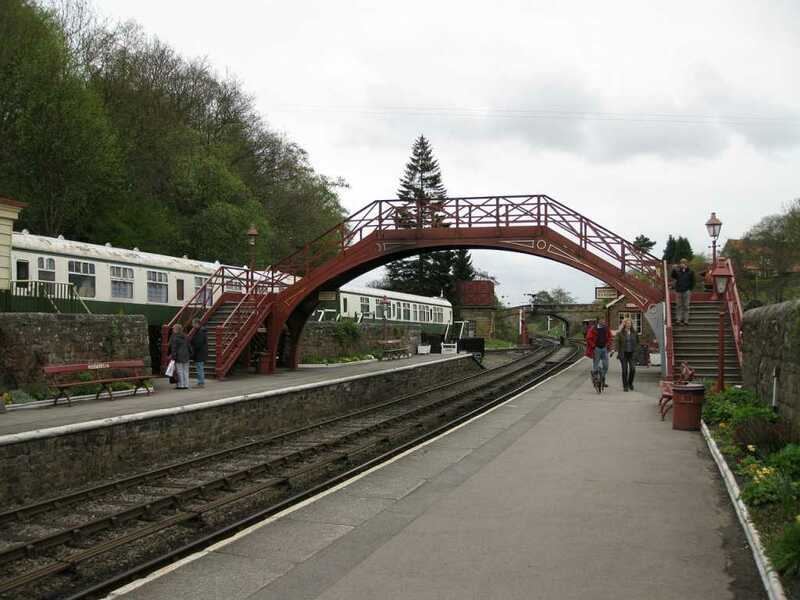 It’s on the North Yorkshire Moors Railway that serves the village of Goathland in the North York Moors. Lacock Abbey, a National Trust property in Wiltshire, in the southwest of England, has been used for a number of Harry Potter shots, for example, where Snape’s potions class took place, where Harry found the Mirror of Erised, and where Harry first heard the basilisk in The Chamber of Secrets. Challenge your friends to a wizard duel, play hide and seek in the grounds and pick up a family trail to explore the area. 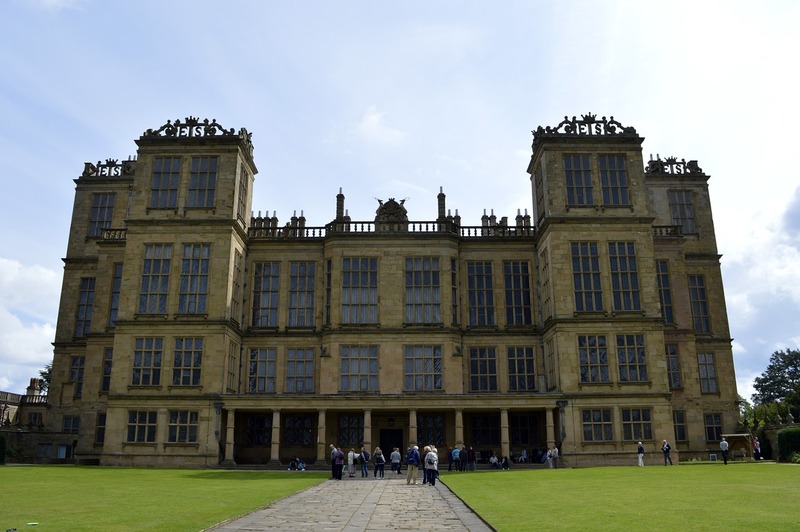 The exterior shots of the Malfoy Mansion in the first Deathly Hallows film were taken at Hardwick Hall in Derbyshire. Managed by the National Trust, Hardwick Estate is open every day, for countryside walks with picturesque views, woodland family play trails, as well as a gift shop and restaurant on site. Part of University College, Durham, and a UNESCO World Heritage Site, Durham Castle was used for some of the exterior shots of Hogwarts. Durham Cathedral’s ancient cloisters doubled as a film location for Hogwarts in Harry Potter and the Philosopher’s Stone, where Harry magically releases Hedwig the owl from his hands. Also used for Harry Potter and the Chamber of Secrets, the setting for Harry, Ron and Hermione being taught how to turn animals into water goblets. The historic village of Lavenham, one of the best preserved medieval villages in England, was the setting for Harry Potter’s family home in Godric’s Hollow with two buildings featured in the movies. No actors were filmed there, CGI was used as backdrop at the studio. 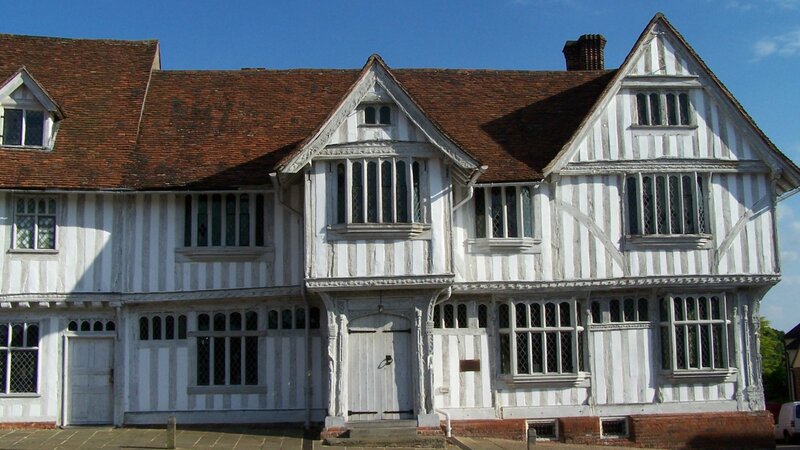 The Lavenham Guild Hall featured as Harry’s parents’ dilapidated home. Dating from the 14th century, De Vere House on Water Street, was the house where Harry’s parents were killed by Voldemort, in Harry Potter and the Deathly Hallows Part 1. The front door of this private home is now one of the most frequently photographed front doors in the country! 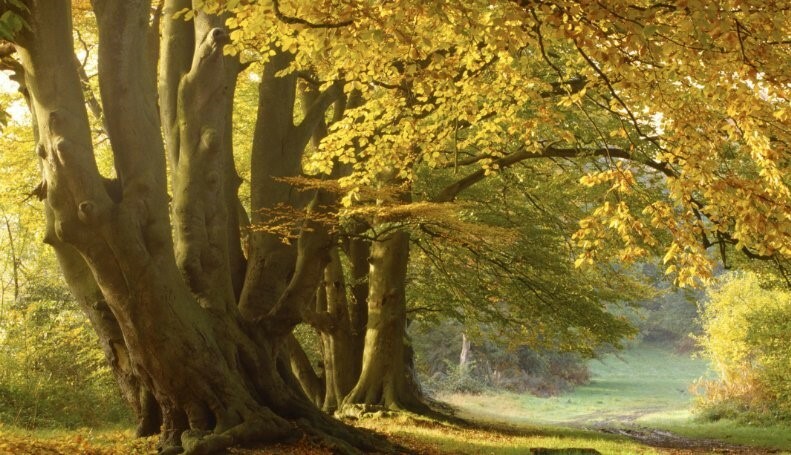 Another National Trust property, Ashridge Estate in Hertfordshire provided the backdrop to more of the films. The Whomping Willow used to be on the Estate, a 400 year old tree, sadly it was lost a few years ago in a storm. Ivinghoe Beacon in the Chiltern Hills also on the estate is the hill on which the ‘manky old boot’, which is actually the Portkey, is found. Quidditch World Cup scenes were also filmed here. Author of the Harry Potter series, J.K. Rowling, lived in Edinburgh at the time of writing the first book. With its medieval alleyways called “closes” and tall narrow buildings with turrets and of course the Castle overlooking the city, you do feel like you are stepping into another world when you visit Edinburgh. There are also some fantastic Harry Potter places to visit and enjoy in Scotland outside of the Capital. 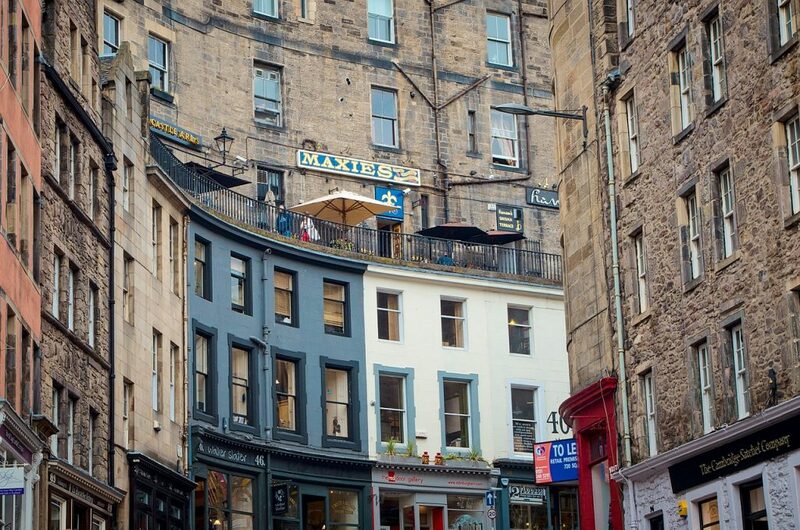 Victoria Street is an old curved street that you can walk down from George IV Bridge to the Grassmarket, while Candlemaker Row then curves around back up the other side to meet the Bridge again. Thought to be the inspiration for Rowling for the magical shopping street Diagon Alley, you’ll enjoy wandering past little shops and cafes. On Victoria Street you’ll find Diagon House – located where previously there used to be a shop selling brushes and brooms – perhaps the inspiration for Harry Potter flying broomsticks? It’s a shop stuffed full of HP memorabilia and gifts. Then stroll up Candlemaker Row to spot the ‘Diagon Alley’ plaque and mural on your way past. 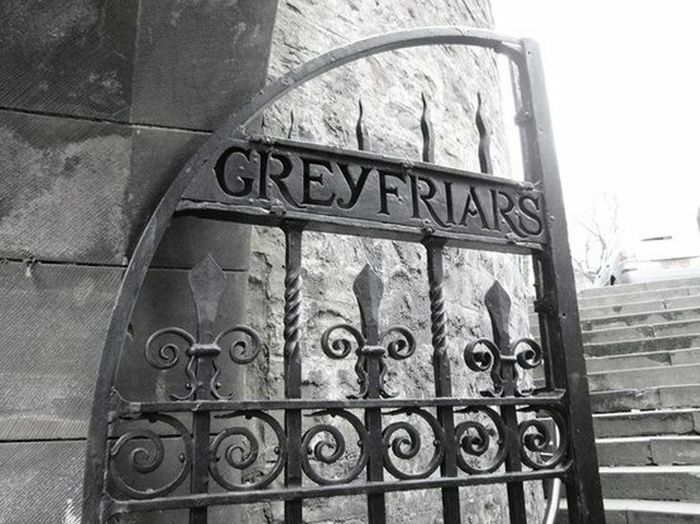 Greyfriar’s Kirkyard is famous for the story of Greyfriars Bobby, the faithful dog who visited his master’s grave for many years. While no filming took place here, nevertheless Rowling took inspiration for Tom Riddle in the graveyard – you can visit the graves of Thomas Riddell Esq and his son, also Thomas Riddell here. Apparently, die-hard fans come every Halloween to pay homage and to duel over the grave of the ‘real life’ Voldemort. Travel Tip: Find the entrance to the graveyard by the Greyfriar Bobby dog statue opposite at the junction of George IV Bridge and Candlemaker Row. J.K. Rowling wrote the first book in the Harry P series at what was formerly Nicholson’s Cafe, now Spoon on Nicholson Street. 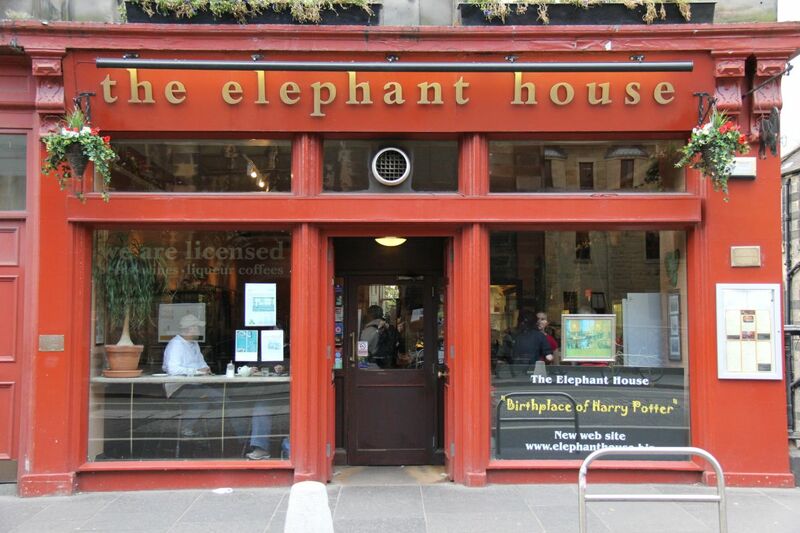 She then wrote The Chamber of Secrets and The Prisoner of Azkaban in The Elephant House cafe on George IV Bridge. You won’t find the cafes in any of the movies but Harry Potter fans are sure to enjoy sitting where Rowling herself may have sat! On the Royal Mile you’ll find the City Chambers, worth a visit to look out for the Hollywood-style plaque paying tribute to winners of the prestigious Edinburgh Award. 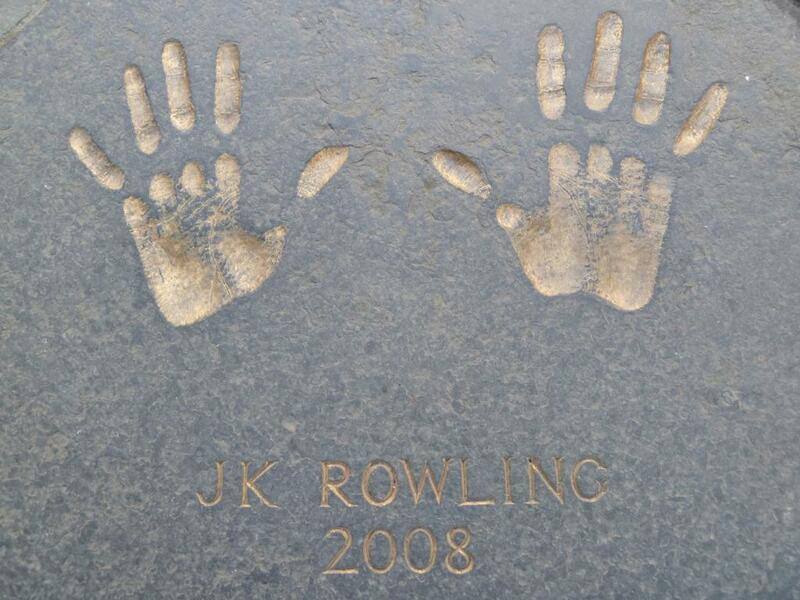 In 2008 it was presented to J.K. Rowling, which means you can see her hand prints cast in bronze in the Chambers’ courtyard! Stunning Glencoe in the western Highlands of Scotland was used for filming for third Harry Potter film, Harry Potter and the Prisoner of Azkaban. Hagrid’s Hut, complete with pumpkin patch and smoking chimney, the sundial and the turreted gatehouse, and the Bridge to Nowhere was built on the hillside above Clachaig. The Hut and other sets built for the movie are no longer there, everything was returned to the way it was, but you could consider a stay at nearby Loch Torren close enough to enjoy walks to view the locations where filming took place. 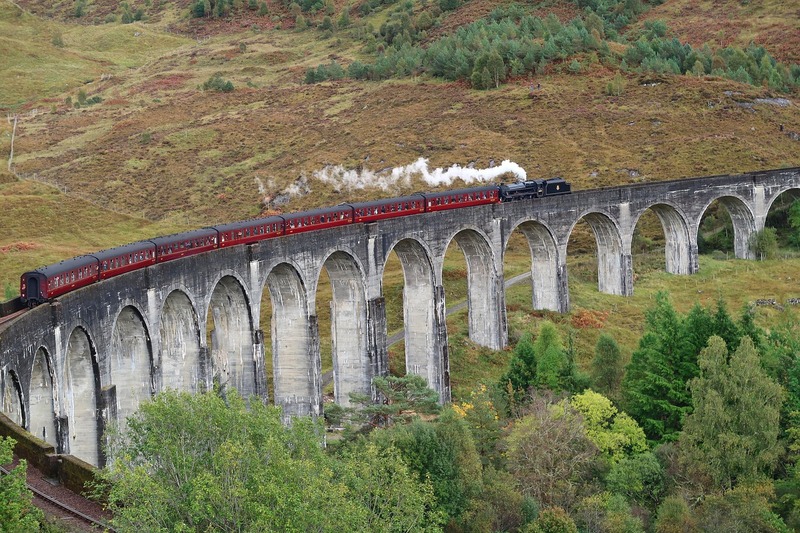 A highlight for any Harry Potter fan visiting Scotland is to take the West Coast Railway Jacobite Steam Train aka Hogwarts Express, travelling 84 miles over the Glenfinnan Viaduct which also featured in the movies. Described as “the greatest railway journey in the world”, this train ride starts near the highest mountain in Scotland (and the UK), Ben Nevis. It then visits the most westerly mainland railway station, Arisaig before passing close by the deepest freshwater loch in Britain, Loch Morar, and finally arriving at Loch Nevis, the deepest seawater loch in Europe. Pay attention when you cross over the Glenfinnan Viaduct, otherwise known as the bridge to Hogwarts! It’s 31 metres high and 380 metres long and you’ll cross it just before Glenfinnan. In Harry Potter and the Chamber of Secrets, the Viaduct featured when Harry and Ron drove the the flying Ford Anglia to Hogwarts. It’s also the place where Harry encounters a Dementor for the first time in Harry Potter and the Prisoner of Azkaban, when the Hogwarts Express stops on the bridge. Loch Shiel located at Lochaber, 12 miles from Fort Williams in the West Highlands of Scotland, was the location of the fictional Black Lake near Hogwarts featuring in both the Prisoner of Azkaban where Buckbeak dips a toe in the water, and the Half-Blood Prince, at the end, when Harry and Hermione look out across it from the Astronomy Tower. 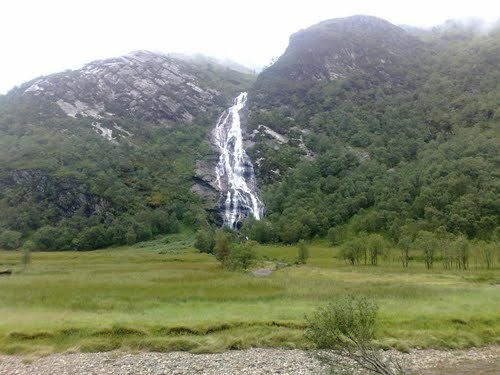 Steall Falls in Glen Nevis is the second-highest waterfall in Britain, and you’ll see it in the background during Quidditch matches, as Glen Nevis was used as the backdrop to the stadium. The falls are also the place where Harry takes on the Hungarian Horntail dragon in Goblet of Fire. Head 15 minutes by car from Fort William to the head of Glen Nevis for a two hour walk to the Falls and back. While there is a clear, well-walked path you will need good footwear, as it does get rocky and rough in places. 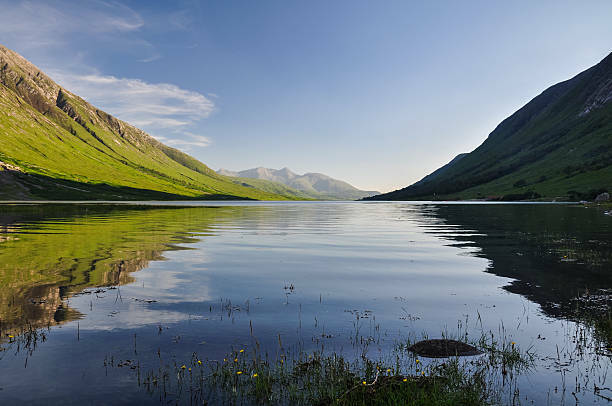 Loch Etive is a long thin sea loch running 35 km from Connell (5km north of Oban) up to Gualachulain. The loch featured in both Deathly Hallows movies. Harry, Hermione and Ron camp near the loch in Glen Etive in Part 1, where Hermione ties her scarf to a tree after Ron and Harry argue. In Part 2, they escape from Gringott’s Bank on the back of a dragon and leap into Loch Etive and then dry out on the shore. 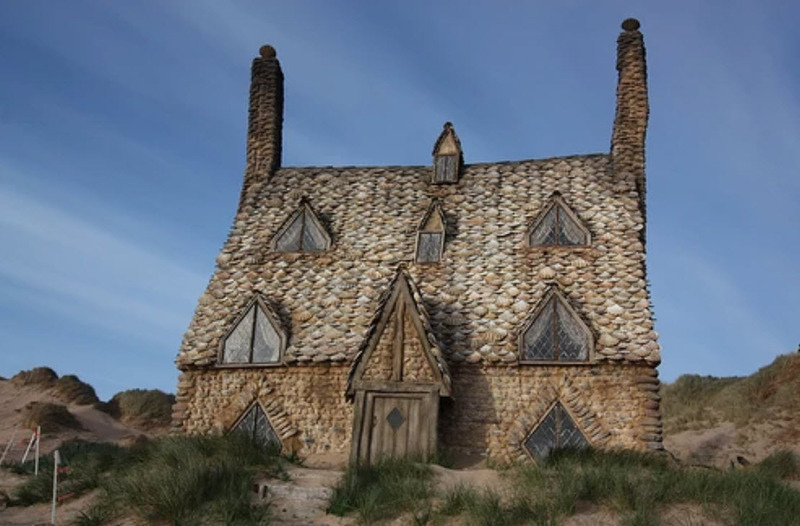 Freshwater West, six miles west of Stackpole in Pembrokeshire, located in Pembrokeshire Coast National Park, was the location for the beach scenes with Dobby for the final film Harry Potter and The Deathly Hallows. You may remember the Shell cottage from the scenes (it’s no longer there), which was constructed on the beach for the movie. Well you probably didn’t expect us to include a Harry Potter Place to visit in Ireland, but there is one! 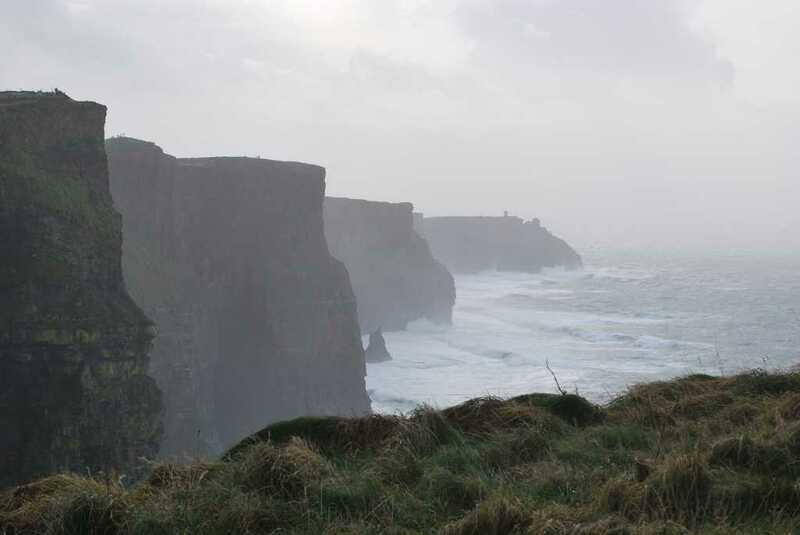 The Cliffs of Moher, in County Clare in the West of Ireland featured in Harry Potter and the Half-Blood Prince, when Harry and Dumbledore go in search of one of Voldemort’s horcruxes in an unnamed cave by the sea. 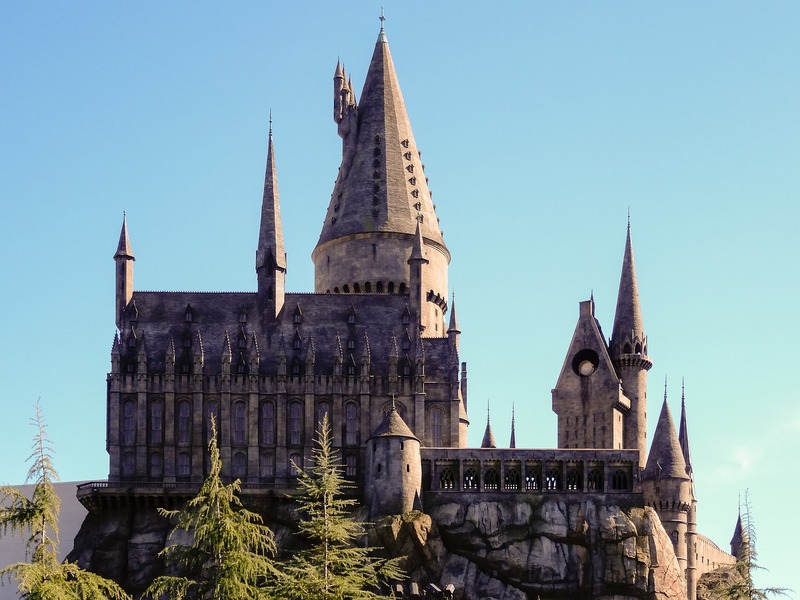 Inspired by the Harry Potter series, you can visit The Wizarding World of Harry Potter at Universal Studios in Hollywood, Orlando and in Osaka, Japan. 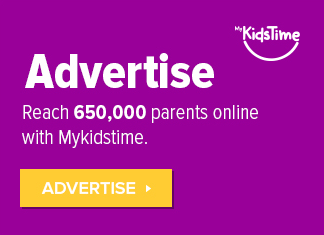 Within the theme parks you’ll find a recreation of Hogwarts Castle and Hogsmeade Village, along with fantastic rides, magical things to do, as well as the usual gift shops and places to eat. 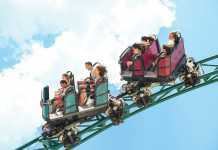 At Universal Studio Orlando, you’ll also find a recreation of Diagon Alley and you can ride the Hogwarts Express train. Although it was created in Harry Potter book-land, Quidditch is alive and kicking in our Muggle world! Did you know you can play Quidditch with 200 teams across the United States? And there’s even a Quidditch World Cup! Check the International Quidditch Association website to find out more about Quidditch across the world. 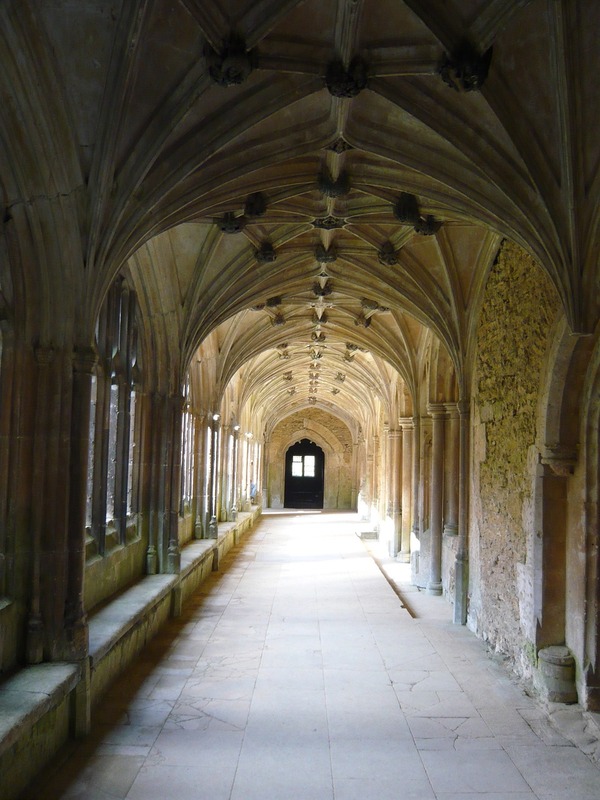 Over to you now, have you been to any of these Harry Potter places? 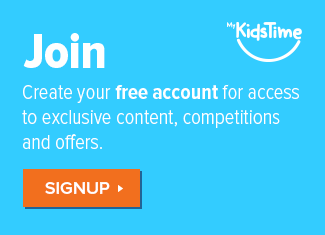 We’d love to hear your experience in the comments below.